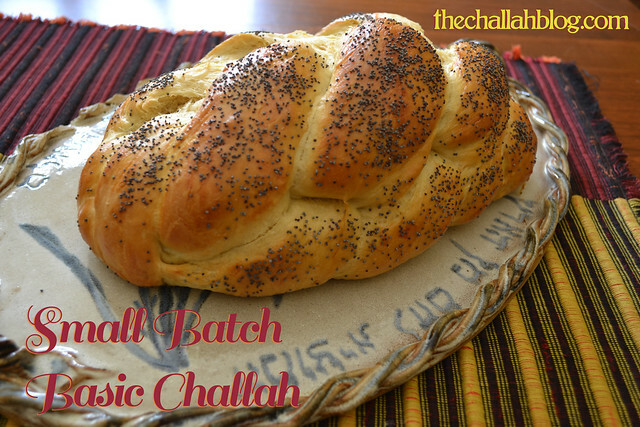 This is a modification of our Basic Challah Recipe #1 with Honey and the Small Batch for Rolls. The only major tweaking from the small batch version is the amount of eggs -- 2 instead of one. 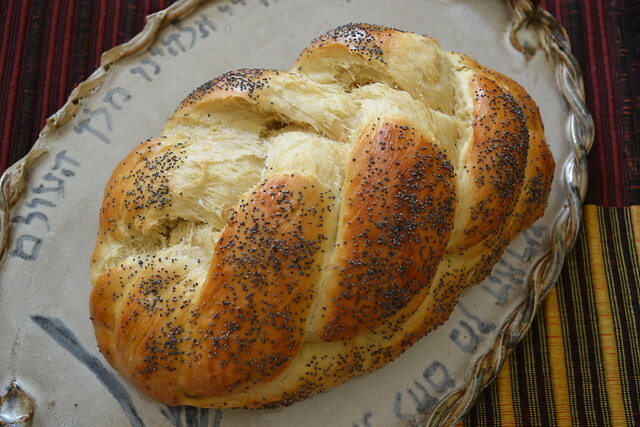 While the roll version works great for what it's intended for (non-egg-washed dinner rolls), I was finding it a little lame for Shabbat challah. SO we added an egg. Now it's perfect. 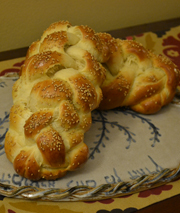 The following instructions are copied from my Basic Challah Recipe #1 with Honey directions. Because this recipe is on the small-side, expect to get two smallish challot or one nice big one. Add eggs and vegetable oil and mix with wood spoon. If the dough is not holding together as a ball, add a bit more oil or water. If the dough is very sticky, add more flour. The dough is ready when it sticks together as a ball and is not sticky to the touch when you poke your finger in (5-10 minutes of beating). Turn the ball out onto a floured work surface and punch a few times until very smooth. Punch down the ball in the bowl and remove. Punch out all air bubbles. Braid in your preferred method. Allow to rise 20-30 minutes. Top with an egg wash (I use the yolk and white) and sesame or poppy seeds if you like. Bake at 350 for 25-30 minutes. (You can read about my oven temperature methods here... basically I put it at 375 for 5 minutes. Then I turn the heat down to 350 and bake for 10 more minutes. Then I rotate the pans 180 degrees and bake between 10 and 15 more minutes.) You can use a bread thermometer (180-200 degrees) or poke at the seams. If they seem doughy, give it more time. You can always add foil if the top seems like its browning too fast. I often have to foil five- and six-stranded challot because they're so much fatter. following the recipe -my dough proved for an hour but did not change its size at all?! I baked them and they were a little bit delicious,( Im hoping that with practice they will get even more delicious! ) regardless of the dough not having risen - have I made a mistake somewhere? I followed the recipe almost to the word... I needed to add a bit more flour though. It's really the best recipe I've used so far..
Hi there! Thanks so much for the comment. I always keep extra flour around as I'm mixing as well... I think a lot depends on the humidity of your kitchen or even outside! I tried this recipe yesterday and I just wanted to say it's one of the best loaves I have ever made. Wonderful stuff, thank you so much for sharing! delish! did it again for Sabbath dinner! This recipe is wonderful, thank you!